So. Many. Grapes. Plus, I’m Still Here…. I know…it’s been a while…way too long, actually, but the summer months…plus class, plus challenge, plus harvest, plus increased responsibility at the day job, plus wine…So, yeah. September was spent doing some professional housekeeping, organizing my office, and reconciling with a long lost family member, who I am so grateful to have back in my life. 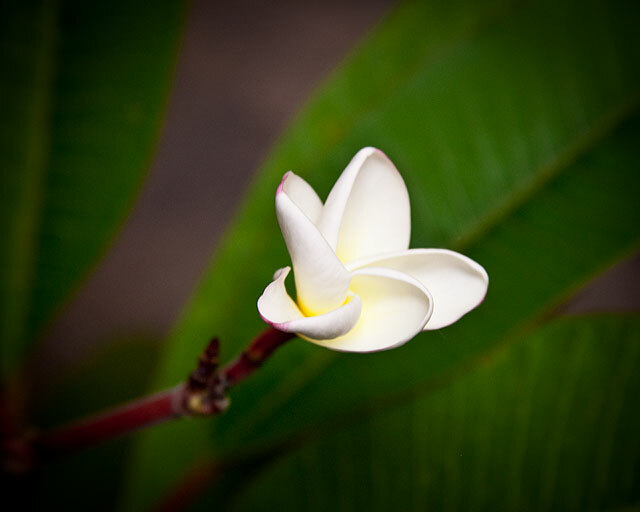 We also got to watch our plumeria actually bloom, which is pretty cool. My mom gave me a cutting in a pot some years back and it hasn’t ever bloomed before. I’d never smelled one outside of a bottle of lotion, and understand that is what lei’s are made of in Hawaii. Mine FINALLY bloomed. The first blossom opened and blew off in a storm, so we brought the plant back in the house and I got the picture at left the other night. So, the other thing I’ve got going on is wine. Yeah…wine. My dad made a LOT of wine when I was a kid (I have memories of my baby sister and me going through the park when it was still called “Kilarny” back in the day, picking yellow dandelion flowers and putting them into paper grocery bags so dad could make his dandelion wine. He also made plum, apple, peach, apricot and wheat (just….don’t do wheat, LOL). We have a friend with a ton of grapes and managed to get our hands on about 15 or so gallons of Noble muscadines…which we spent the better part of our last couple of evenings rinsing and de-stemming. Hoping to crush them tomorrow or Friday. Will kind of try to document that process here, as well. Noble Muscadines in the sink. I also had my first photo shoot in over a year, and it was soooo worth pulling the camera out of the bag and blowing the dust off of it. Hope to be sharing that adventure with y’all, as well. This entry was posted in Family, In the Yard, Photography, The Day Job, Uncategorized and tagged hummingbirds, life, muscadine, wine making. Bookmark the permalink. 6 Responses to So. Many. Grapes. Plus, I’m Still Here…. Great to hear from you! Enjoyed hearing what you’ve been up to. Sounds like all is good, and I’m glad to hear that. 😊 yes… We are good, and slowing down for autumn. finally!